Whether you are feeding a client meeting, visiting a doctor's office or planning an executive meeting, we have a solution for you. 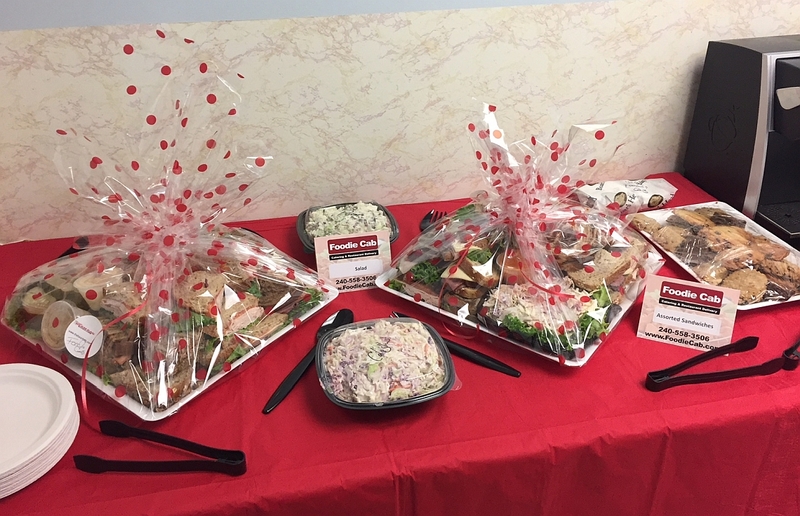 Order online or if you prefer, reach out to one of our #CateringGurus at 240-558-3506, who can put a proposal together for you in the blink of an eye. With over 200 local restaurants menus to choose from, you can't go wrong. We can help you plan meals for 10-500 people and have them delivered to you within the hour. Catering options or individually-packaged and labeled meals are available. Our #CateringGurus understand your needs. Our dedicated and experienced account managers' goal is to earn your trust and make your life easier understanding your group's needs. You provide us with your parameters: budget, dietary needs, food preferences and your schedule -- and we take care of the rest. Since we coordinate your delivery directly with the restaurant, we guarantee our delivery times*. Foodie Cab's Rewards and Referral program earns you gift cards for every order you place. You receive them in the mail once a month and are free to use anywhere you choose. Our gift cards never expire and can be redeemed at brick-and-mortar stores as well as e-commerce websites.